The Toyota Corolla is an impressive chapter in the book of the model’s extensive history. It’s not totally perfect, but it comes close. With a bunch of safety features and a new transmission, the Toyota Corolla’s arsenal of reliability, convenience and practicality gets a bit bigger and harder to pass up. It has its issues with drivability and won’t wow buyers who are after a sportier drive, but the Toyota Corolla’s strengths in other areas make it a worthy car to consider. The Toyota Corolla provides a 6.5-inch touch screen. The Toyota Corolla may be a compact sedan, but its interior is surprisingly spacious. On the inside the car in almost every way is ergonomic and seems to wrap around the driver. It’s a snug fit, but everything the driver needs to interact with is well within reach. Toyota has done very well to keep its focus with the car as being as practical as possible, while still keeping up to date with its competition. The Toyota Corolla provides a 6.5-inch touch screen that’s not complicated, decent quality plastics, plenty of leg room and manually-adjustable front seats. At 13-cubic feet the Toyota Corolla’s trunk space keeps up with the Ford Focus and barely falls short of the Honda Civic and Chevrolet Cruze. The trunk has an interesting layout, in that instead of having a square shape it’s wide at the back of the car and the more it goes inward the narrower it gets. At 13-cubic feet the Toyota Corolla’s trunk space keeps up with the Ford Focus and barely falls short of the Honda Civic and Chevrolet Cruze. It’s big enough to take at least two large duffle bags on a trip, and with its comfort and reliability the Toyota Corolla is well equipped to handle the journey. The Toyota Corolla seats up to five people including the driver, although as with most cars of its class the back-seat passengers will suffer with minimal leg room. Thankfully, stepping in and out isn’t a problem for taller passengers, and it’s capable of plenty of head space. Inside the car, even at high revs the engine’s shouts can barely be heard. Most notable about driving the Toyota Corolla is the absence of a noisy ride. Inside the car, even at high revs the engine’s shouts can barely be heard. 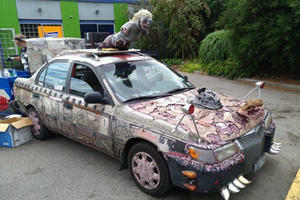 Again, the Toyota Corolla is all about comfort and providing the driver with a nice, easy ride. In terms of handling, the Toyota Corolla does fall a bit short against the competition. The steering is light, so it feels like a larger car. The handling is fine, but we’d prefer the steering to be tighter and less imprecise. Bottom line is, the Toyota Corolla won’t wow the driver with an impressive display of mad cornering prowess. Visibility in the Toyota Corolla is surprisingly good. Visibility in the Toyota Corolla is surprisingly good, however. The side-view mirrors are of a good size, the pillars don’t generate too many blind spots and the rear-view mirror is easy to see out of providing no one is sitting in the middle back seat. It’s a 1.8-liter four-cylinder gasoline engine that only produces 130-hp and 128 lb-ft of torque. The Toyota Corolla has always been about comfort and convenience, practicality and safety. The main deterrent from purchasing the Toyota Corolla though, could be its engine. There’s only one engine offered across all models of the Toyota Corolla, and it’s not very impressive. It’s a 1.8-liter four-cylinder gasoline engine that only produces 130-hp and 128 lb-ft of torque, whereas similar units in rival cars produce more power (138-hp for the Honda Civic, and the Chevrolet Cruze produces a very impressive 180-hp). The weak engine doesn’t help with the gas mileage. 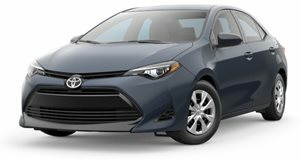 Toyota claims an average for the Corolla of 28 mpg city/36 highway, which are some of the lowest you’ll find in this class. The base model comes standard with a continuously variable transmission, or CVT, which functions as a conventional automatic. The Toyota Corolla does have a couple transmission options available, and both are well worth it. The base model comes standard with a continuously variable transmission, or CVT, which functions as a conventional automatic. The Toyota Corolla SE comes with a manual transmission, but it’s an extra $3,000 on top of the base L model, which starts at around $18,500. If a manual transmission is desired in one of the competing vehicles however, the Chevrolet Cruze L sedan comes standard with a manual transmission starting at $17,850. The Toyota Corolla’s CVT is something to boast about though. It’s fancy with optional paddle shifting and is reported to not “drone” like other CVTs. In comparison, the manual transmission has tall gearing, so the shifting will feel long. the Toyota Corolla performed well on the safety front. Toyota has seriously upped its game when it comes to safety. The Toyota Corolla comes with an optional package that includes several high-end safety features. With the Safety-sense P package, available with all Toyota Corolla models, the car will come equipped with forward collision warning, automatic emergency braking, automatic high beams and lane departure warning, which helps drivers to steer back into their lane should they start to drift away. As a result, the Toyota Corolla performed well on the safety front, having been awarded four-out-of-five stars in its most recent crash test. We’re more inclined to recommend the mid-range SE version. At first glance the price of the Toyota Corolla may seem off-putting. The base L model starts at 18,500, whereas the Ford Focus sits comfortably as the cheapest of the competition at $16,775. That said, you will likely get quite a bit of that back come resale time, as the Toyota Corolla has some of the best residual values of any compact car on sale today. It also helps that the Toyota Corolla also has very competitive reliability ratings, so there shouldn’t be any need to fall back on the three-years/36,000-miles bumper-to-bumper and five-years/60,000-miles powertrain warranties during your ownership period. Specification-wise, we’re more inclined to recommend the mid-range SE version. Included in its $20,000 sticker price is the very good CVT automatic, the aforementioned safety package and enough features to satisfy the needs of most buyers. All in all, the new Toyota Corolla is a great buy. It’s expensive compared to its competition, yes, but that price will go a long way. The Toyota Corolla is certainly on the weaker side with its engine performance, and even compared to the competition it’s lagging a little on the fuel efficiency. However, with its lineup of newly-available safety features and a new transmission the Toyota Corolla is a smart buy for the commuter. 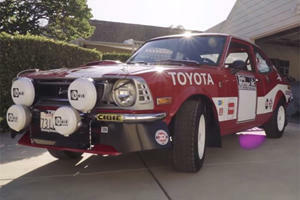 How about this: it's powered by a Mazda rotary engine. Nothing worse than trying to impress your prom date with fast driving and being met by Hootie and the Blowfish.